Brain haemorrhage. 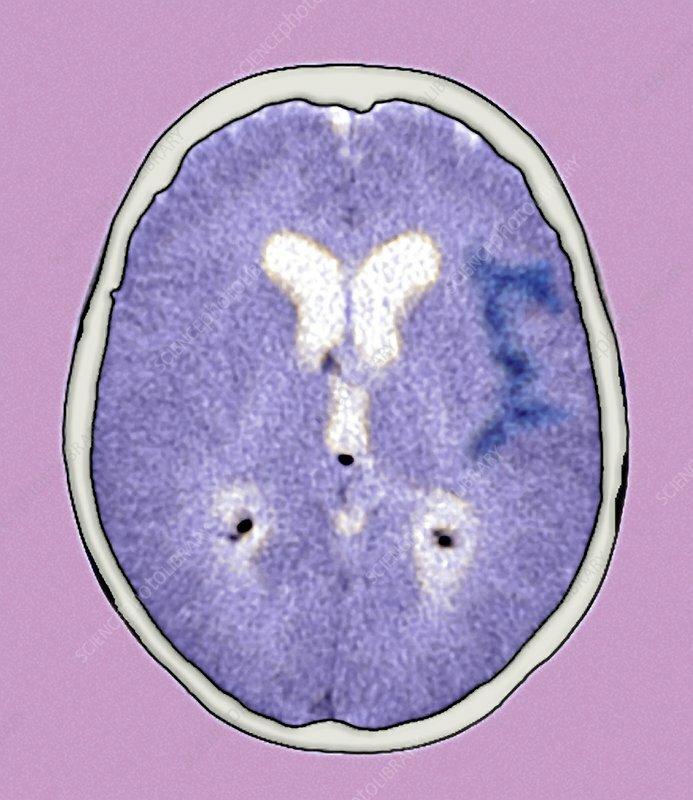 Coloured axial (horizontal) CT (computed tomography) scan through the head of a patient with a brain haemorrhage. This is the dark blue area at upper right in the frontal area of the brain's left hemisphere. It is a subarachnoid haemorrhage, which means bleeding into an area below the arachnoid membrane, one of the membranes covering the brain. The blood puts pressure on and can damage the brain. The condition often results from a head injury or the rupture of an aneurysm, a swollen and weakened blood vessel. Treatment usually involves surgical removal of the clot. CT scanning uses X-rays to image body tissues.